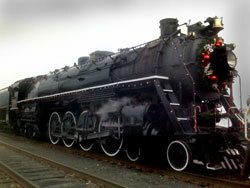 The Spokane, Portland & Seattle (SP&S) steam locomotive #700 made its final, official run, on May 20, 1956. The Farewell to Steam Excursion attracted 1375 passenger who piled into 21 cars in Portland for a trip to Wishram, Washington and back (The Oregonian, 21-May-1956). The train’s engineer, J. T. Craine, Vancouver, Wash., whose 38 years of railroading included service as fireman on No. 700 that morning in 1938 when it made its maiden run over SP&S tracks, was definite in his opinions. A loving hand on 700’s controls, he grieved.